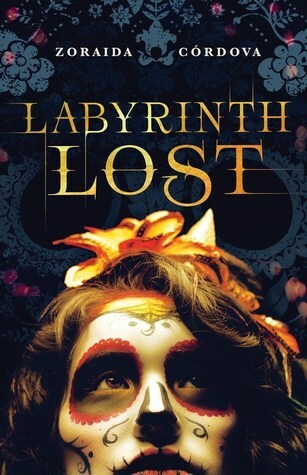 Note: I won an copy of this book via Samantha’s YA Halloween giveaway. Now, she has to turn to Nova for help to get them back. But getting them back from Los Lagos – a place where the dead rest before passing on and where Brujas are banished into exile by the Deos – is not going to be easy. Bringing in elements of Latinx culture and folklore into its world-building of magic systems and ancestry, this book was all kinds of wonderful. I loved how centered it was on family and traditions passed down from generations. It is something that I don’t read a lot in fantasy world-building these days. I mean, maybe it is just the genre- but everything is so large-scale with huge stakes, kingdoms, and borderline-dystopian, if not dystopian. The world in Labyrinth Lost felt “smaller” in geography but cozier. Even when the story shifts from regular Brooklyn to the magical Los Lagos, it felt like some strange private island and not an open battlefield. I think by keeping the actual magical locations easy to remember and understand, the author could focus more on what Alex was going through emotionally in trying to understand and process what is happening around her and within her. (Psst.. it does help that we get a map of Los Lagos). I can also now understand why this book made it to so many of the LGBT recs list last year. Alex’s bisexuality is presented in the same way any cishet characters’ romance would have. This is how it should be in fiction, and I needn’t have to be “applauding” a book for it. But it doesn’t happen that often. So kudos to the author for such a casual, non-gimmicky rep. Thank you for not unintentionally othering Alex. There is enough of that nonsense going on in real life. I loved all the Mortiz family scenes, especially with her older sister Lula. It was nice to see her not being the usual older sister stereotype – rude, bitchy, insecure and aloof from the rest of the family. I can’t wait to read about all of them again in the next book and maybe see more of them. This book, understandably, was all about Alex getting her family back so we don’t read much of them in this book. Although, the author does manage to make their presence felt as much as possible during Alex’s journey. I rarely see Hindus as one of the MCs, so it was nice to see Rishi Persaud not just being a token desi character. (Sidenote – Rishi is a very uncommon choice of name for a girl.) It was also nice change to see a desi who is not shown as conforming in terms of styles or choices. (I am not saying that it is not accurate rep, but it is just that I have already seen such characters in too many books, so Rishi was a welcome change) Oh, and thank god she is not eating “naan-bread” or “chai tea” but just roti and dal. No, seriously, I thought if I did look twice, I would see “roti-bread” or “dal-lentil” instead. I am not sure how I feel about Nova though. His backstory and motivations were explained in the end but it was all at once and it felt rushed, and I don’t think I even understood it in terms of the “magic logic”. I also feel that in terms of magical concepts, the plot might have been.. stronger (?) if all the explanations didn’t come back to (or rely heavily on) souls. (So many of the other elements that we see throughout the book, like magical creatures, just come together in the end like some sort of a monolith.) That just made some things in the end feel less menacing than it should have been. The main villain – the Devourer – definitely should have creeped me out. But I felt like I could have probably taken a kitchen knife, jumped into the pages and stabbed her in the – well, wherever her heart is supposed to be. I can’t wait for synopsis of the second book to come out. The tidbit released by the author last month has me wondering whether it is again going to be from Alex’s POV or someone else’s. Great review! You have a very humorous writing style. I nearly spit out my tea (I won’t say “chai tea”) when I read: “No, seriously, I thought if I did look twice, I would see “roti-bread” or “dal-lentil” instead.” Then I thought, “Gosh, I hope I don’t do that in my own writing!” [I’m not sure yet; I’ll look]. I definitely enjoyed this book and I see a lot of potential for her next books!